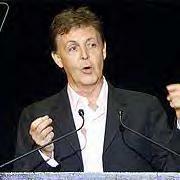 Paul McCartney teams up with Britney Spears! London, England. April 7- Last November, Paul McCartney's fiance Heather Mills introduced the ex-Beatle to her dear friend Britney Spears. McCartney was enlightened to meet the pop star. Spears and McCartney met frequently to discuss their music, and eventually started composing songs together. 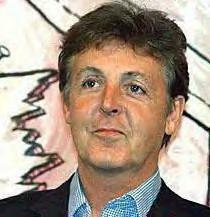 Mills encouraged the idea of an album, but McCartney thought that fans might be overwhelmed, so Spears decided on a single. This single was released today and McCartney is waiting for the fan's response. The A side of the single features "Identity Crisis", a song about finding your true self. The B side has a remake of "All You Need is Love" which McCartney insisted on, in hope of pleasing his Beatle fans. Maybe I'm a man, maybe I'm a lonely man? 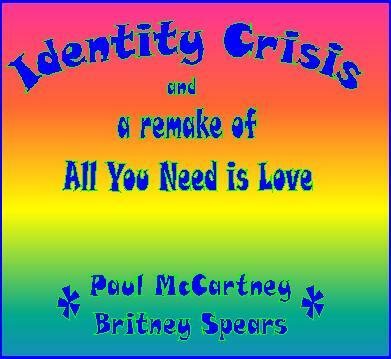 In spite of the release of "Identity Crisis", AYNB managed to snag and interview with Paul and Britney. AYNB: So Paul, how did you and Britney meet? Paul: Well Katie, Heather has a lot of connections and happens to be a dear friend of Britney and she just arranged everything, it was great. AYNB: Miss Spears, what was your reaction on meeting the famous Paul? Britney: Uhm...I like didn't even know who he was. But you cant blame me, I mean since I didnt grow up with the Beatles or anything. Heather and I are like sistas! But like she never mentioned anything about her dating a musician til like after they were engaged. I think it was cuz he's old and saggy. If I were dating someone like that I wouldnt say anything eather. But like anyways, when I met Paul my first impression was "he's as old as my grandpa, what the hell is Heather smoking?" AYNB: Now that you know Paul, do you like the Beatles' music? AYNB: What do you have to say about this, Paul? Paul: Everyone's entitled to their own opinions. AYNB: What is the meaning of your song "Identity Crisis"? Paul: It's about us trying to find our true selves, and what we really have to offer in life. It's an enlightening song. AYNB: Well thank you very much Paul and Britney, I look forward to any upcoming music you will be writing. London, England. May 10- In response to the well recieved single that was released early last month, Paul McCartney and Britney Spears have announced that they will be making a full length album and it will be released next summer. The two have formed a band called The BritMacca ~*Experiance*~. McCartney says "I am thrilled to be working with a whole different audience, but it seems a bit unreal." Note: Everything on this page is PRETEND, FAKE, NOT REAL! It is merely for entertainment and not to offend anyone. I don't take kindly to hate mail, so you might want to consider what you're gonna say if you have a problem with this page.